In what follows, we deal in some detail with the first three of these five. The remaining two receive brief mention. We have learned from Scripture that the Lord cares for His Church by using people as His tools. Firstly, He uses all of us in the office of all believers, to which we have all been anointed by the Holy Spirit. As prophets, priests and kings, we are all mandated and equipped to confess God’s Name, live in thankful service to Him, and fight against the attacks of Satan (HC, LD 12). Secondly, God calls and enables some of His people to serve in the special offices, namely the offices of elder and deacon. When the apostles preached the Gospel of Jesus Christ in places such as Philippi, Ephesus, Corinth or Rome, the Lord blessed their work by converting many hearers to the Christian faith. These converts, however, were in need of much instruction for they were either Jews who had tenaciously clung to the Old Testament or Gentiles who knew (next to) nothing about the Bible at all. In a word, they had grown up in a heathen environment, and were saturated with heathen habits, values and views. The elders had the responsibility of teaching these new converts. What made this task the more difficult was that the elders had to give such instruction in a society that had no Christian background. In our society today, the influence of a Christian heritage is still very present. Concepts as Sunday observance, the husband’s headship in the family, having only one wife, etc, have a place in our cultural heritage. This heritage did not exist in the days of the early church. So the elders had to teach the people very much from the ground up. As soon as there were a number of converts in a particular place, these converts needed to form one congregation. They were, after all, a communion of saints. But if they were a communion of saints, they also had to be a communion of saints, one body functioning together for mutual benefit. This was a new concept, and undoubtedly required much instruction on the part of the elders and self-denial on the part of the new Christians to function as one body. Here was need for leadership on the part of the elders. Many recent converts from heathendom invariably resulted in many heresies finding their way into the churches. As an example: Paul and Barnabas, upon their return from a missionary journey, settled in Antioch and taught the church there (Acts 14:26-28). However, in Acts 15:1 we read “And certain men (these were Christians! ), came down from Judea and taught the brethren, “Unless you are circumcised according to the custom of Moses, you cannot be saved.” Here we have Christians who cling to the teaching of their youth, namely, that one needs to be circumcised in order to be saved. Similarly, we read in 1 Corinthians 5 of a church tolerating the sinful practice of a brother living with his stepmother – a leftover of the promiscuity that characterised the lives of the Corinthian Christians prior to their conversion. The letters of John attack the heresy of Gnosticism, a teaching that tries to harmonise the Christian faith with Greek philosophy. We can understand that the elders (particularly after the apostles died) were required to give leadership in the face of these heresies. This put very much pressure on the elders. There were very few copies of the Bible available to the new converts or to the elders. The Bible at that time consisted of only the Old Testament, plus some letters of Paul circulating amongst the churches. Since copies had to be handwritten, copies were scarce. So the onus fell the more on the elders to teach the people and to defend the truth. All in all, these factors made for a challenging workload for the elders, requiring of them to exercise an enormous amount of leadership. When the elders were in need of help in the early days, the apostles were the obvious source to turn to, for after all, they were inspired by the Holy Spirit. Even in their prison cells the apostles wrote letters of instruction and encouragement to the churches. However, in time the apostles all died, leaving the elders with the responsibility to lead the churches. In view of the pressures under which the elders had to function in the days of the early New Testament church, it’s not surprising that it was the more gifted and the more knowledgeable men who became ‘the leaders amongst the leaders’; the one elder elevated above the other elder. The bulk of the workload landed on the shoulders of those who had the knowledge. Furthermore, due to a lack of knowledge on the part of individual believers at that time, the office of all believers didn’t function at its optimum. Hence, over time there developed a division between the office-bearers (the clergy) and the common people (the laity); a division between the more learned, particularly the ministers, and those who were not so knowledgeable. Here I take the liberty to insert a word of admonition. Let each one of us be aware that this division between ‘clergy’ and ‘laity’, between the ‘knowledgeable’ and the ‘less knowledgeable’ can easily develop again. Though the membership in the Free Reformed churches in Australia today tend to be rather well read and informed, we need to ensure that we never let our clergy become leaders of dumb sheep, simply because they are the only ones who have the knowledge and we haven’t made it our business to stay informed and to think through on the issues that be. It is the duty of us all as individual believers to constantly be busy with the study of the Bible, the Confessions and the history of the Church. The apostles appointed elders in every church (cf Acts 14:23; Titus 1:5). In I Timothy 5:17 a distinction is made between “elders who rule” and “those who labour in the word and doctrine”. (See Section 2.2 above.) The “elders who rule” are known to us as ‘elders’, while “those who labour in the word and doctrine” are known to us as ‘ministers’. in times of persecution the minister is often the first person to be arrested, causing people to respect and honour him for his suffering for Christ’s sake. Eventually the term ‘elder’ vanished in the churches, and the minister alone received the title of Bishop; the minister was regarded as ‘THE elder’. This led to what is called ‘Dominocracy’ (‘domino’ = minister, ‘cracy’ = to rule). Over time the extent of the bishop’s authority broadened. Not only was the bishop ‘the’ ruler of the church in his own town but he also became the ruler over the leaders (later known as priests) of the churches in the smaller, neighbouring towns. In due time a country was divided up into several diocese which all fell under the jurisdiction of the one bishop. So it became unlawful for bishops to be appointed in the smaller towns; the smaller towns had to be satisfied with a priest, who in turn had to report to his superior in the big town, the bishop. when the empire fell to Alaric in 410, the bishop of Rome was much involved in preventing wide-spread destruction. So he had the respect required to fill something of the vacuum left by the collapse of the emperor’s authority. So we see how the church ended up with an authority structure of priests, prelates, cardinals, bishops and Pope where it was the Pope who ruled the entire western world, down to the priests at the bottom of the ladder who ruled over the village church. The church, after a period of about 400 years, had adopted for itself the authority structure of the secular political and economic system of the time, namely, a graded organisation of authority. Although we can appreciate the enormous pressures under which the apostles and elders had to labour in the days of the early Christian Church, we yet need to bear in mind that this hierarchical system of church government was not the way to alleviate these pressures. Scripture had not been the guide in seeking the answers needed. Although the Pope appealed (though wrongly so) to Christ’s words of Matthew 16:18 in defence of the authority he claimed, he failed to reconcile this with what God has revealed elsewhere in His Word concerning the authority of the office-bearers in the local churches. Papal church government is Monarchical: ‘mono’ = one; ‘archo’ = rule. The Pope is the sole ruler. Papal church government embraces the notion of one, large ‘universal’ church made up of smaller member churches. Because the papal view of the church is first of all ‘catholic’ or ‘universal’ (instead of seeing each local church as complete in itself), the authority structure naturally became hierarchical. The authority of the Bible is replaced by the authority of one man: the Pope. The first Vatican Council of 1871 declared the Pope’s word to be infallible. The office of all believers is not upheld. In the Roman Catholic Church one does not need to know the Bible; to be saved one need only believe that the church’s faith is correct. On October 31, 1517, Martin Luther nailed his 95 theses to the door of the church at Wittenberg. In one of these statements Luther denied that the Pope was the Head of the Church. Thereby he threw overboard the Papal system of church government. As a result of Luther’s rejection of the papal system of church government, the Pope in Rome issued Luther with a statement of excommunication. Luther had been expelled from the church. Luther expressed his appreciation for the Pope’s decision by publicly burning the excommunication document on December 10th, 1520. In so doing he reiterated his rejection of the Pope and Papal church government. Luther’s refusal to submit to the Pope as the head of the church was scripturally correct. Christ alone is Head and this is what Luther tried to reflect in the system of church government he saw to be the scriptural alternative to the papal system. Luther took seriously the office of all believers. He had learned from the Bible that the outpouring of the Holy Spirit made all believers partakers in the anointing of Christ. This means that each believer lives in a bond of faith with Christ, and so has been anointed to the threefold task of prophet, priest and king. So each individual believer must be involved in preaching, in serving others within the communion of saints, and in fighting against Satan’s attacks on himself and his fellow saints. Luther sought to incorporate the reality of the office of all believers into the system of government he wanted for the church. However, the system of church government Luther had in mind did not find its way into the church due to the economic circumstances in Germany in 1525. Thousands of serfs, (i.e. the poor who owned no land) revolted against the rich landowners on whose land they lived and worked. The serfs rejected the authority of those over them, but could not in turn develop fitting authority structures to replace the ones thrown overboard. The resulting chaos demanded leadership from the very persons against whom the serfs had revolted in the first place. This authority of the ruling class in secular society found its way into Lutheran churches as well. Since government obviously could not be entrusted into the hands of the plain people, Lutheran churches ended up with a system of church government that included the secular government. That is, the secular government received the right to control affairs in the church, appointing ministers, elders, and deacons in communities and receiving the right to exercise church discipline. 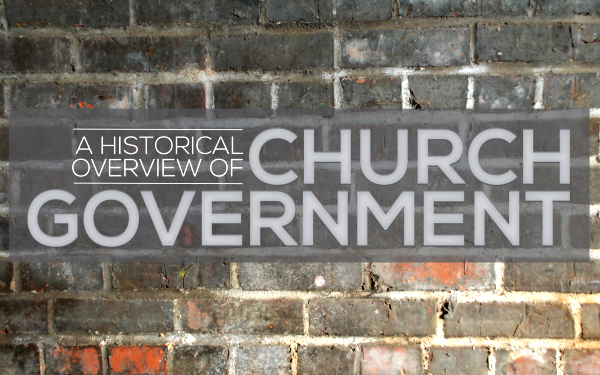 In various countries, the church even became a government department. A man by the name of Erastus took this government-centred concept and fine-tuned it. Hence Lutheran church government is also known as Erastian church government or Erastianism. The authority of the Pope, then, was replaced with the authority of the king. This king was not only the head of state but also the head of the Church. In the Church of England today, the reigning monarch is still officially the head of the church. The churches in Holland were also influenced by Erastianism. For about 200 years after the Synod of Dort, the government prevented synods coming together and this eventually resulted in the Secession of 1834. Lutheran church government is monarchical: ‘mono’ = one; ‘archo’ = rule. Not the Pope but the King is the sole ruler. Lutheran church government embraces the notion of a national church, formed along national boundaries. The local church has no authority. The office of all believers has no place. As the Reformed faith gained acceptance in Europe, its influence also became evident in the sphere of church government. Much of the ground work must be attributed to a man by the name of Martin Bucer. Like Luther, his starting point too was the notion of the office of all believers. All believers, he learned from Scripture, are righteous in Christ and live in a bond of faith with Christ, partaking in Christ’s threefold office of prophet, priest and king. These believers though are not so many individuals but come together as a congregation, a church, and the Head of every church is Christ. As Head, Christ rules over His church. He rules by means of the office of all believers, but specifically through the elders. Through the preaching of the Word the Holy Spirit works faith in the hearts of man, and Christ assigned the task of preaching to the elders. It is by the two keys – the preaching and church discipline- that the elders open and close the kingdom of heaven. The power of these two keys is given to the congregation (Matthew 18:17), but exercised by the elders. Christ appointed “some… pastors and teachers for the equipping of the saints for the work of ministry, for the edifying of the body of Christ” (Ephesians 4:11f). There, according to Bucer, lies the heart of Reformed Church Polity. Church Polity doesn’t serve the best interests of just one or a few men, as is the case in papal church government, but serves the pastoral purpose of ensuring that the congregation grows in Christ. Reformed Church Polity exists so that the congregation may receive Christ’s gifts of faith, righteousness and holiness. The elders have the authority to work with the two keys of the kingdom of heaven for the sake of the edification of the congregation. John Calvin built his understanding of church government on what Bucer had learned from the Bible. Calvin too emphasised the office of all believers and that local believers form a church which Christ wants governed by office-bearers. The local, visible church is all important to the work of the Holy Spirit, for He works faith through the preaching and the preaching is delivered from each local pulpit. In the local church, then, the elders are to carry out the office that Jesus Christ has laid on their shoulders, namely, exercising the keys of the kingdom. It is said that “Calvin checkmated the Pope with the pawn of the elder.” What God requires of the elder is not riches, intellect, education, social standing or fluent speech. The only quality God has stipulated is FAITHFULNESS to Him. God is pleased to use the “pawn of the elder”, the ‘little man’, in order to cultivate growth in His congregation. Only the man who knows the power of God is able to encourage people in their service of the Lord. This is the type of man God desires as leader in His church. In 1 Timothy 3:1-13 and Titus 1:5-9 Paul lists the qualifications God looks for in men suited for service in the office. There we do not read that they need to be wise by worldly standards, nor that they need to be skilled speakers or debaters. These were prized qualities in the eyes of the Corinthians (cf 1 Corinthians 1:18-29). Rather, .”.. a bishop must be blameless, as a steward of God … hospitable, a lover of what is good, sober-minded, just, holy, self-controlled, holding fast the faithful word as he has been taught, that he may be able, by sound doctrine, both to exhort and convict those who contradict” (cf Titus 1:5-9). It is the faithful man whom God calls to serve as elder. By the faithful labours of such ‘little men’, the Faith of the Bible could grow in Europe – and the power of the Pope be broken. Reformed church government is known by the word Presbyterial, ‘presbyter’ being the Greek word for elder. In other words, Reformed church government is elder-centred church government. 1 Timothy 5:17 speaks of two kinds of elders (known to us as the ‘minister’ and the ‘elder’), but the one does not have more authority than the other. (Characteristic of Reformed church polity is not the minister but the elder). Therefore let the elders speak up at Consistory meetings and Synods, let not the ministers make the decisions! At the same time, let the young men in the congregation prepare themselves for the office. God doesn’t ask for a fluent speaker, a good reader, a university degree. All God asks for is men who are faithful to Him, who love Him, His Church and His work. Ironically, the concept of church government which Calvin promoted did not get off the ground in Geneva where Calvin lived, but it was taken to France, the Netherlands, and Scotland. In these places a presbyterial form of church government received a prominent place in the church. Within the category of Reformed / Presbyterial church government we have the Church Order of Dort, which is part of the history of our churches, and also the Presbyterian form of Church Government. Both fit into the category of Reformed church government. Reformed Church government acknowledges that Jesus Christ is the Head of the Church, and He rules His Church by the office-bearers, the elders. Reformed Church government emphasises first of the local church; i.e. the gathering of the saved in the community where the Holy Spirit works faith through the preaching. Reformed Church government recognises that all believers are mature Christians in that all have received the Holy Spirit and so all are equipped to carry out the office of all believers in the context of the congregation of which they are members. After the Reformation in the sixteenth century, Reformed Church Polity took hold in Scotland, including its basic characteristic emphasis on the office of all believers and on the church as local gathering. In the course of time (1640-60), however, there arose a group who did not appreciate the need for a bond of churches. They argued that the New Testament Scriptures neither prescribes a bond of churches nor tells us of congregations bound together by a super-structure as a classis or a synod. They preferred, then, to see each local church as independent from other churches in the neighbourhood. Each local church, they maintained, is responsible only to the Lord. It is interesting to note that these independents did not insist on adherence to any confessions. The arguments mentioned earlier for developing a bond of churches (assisting each other in the preservation of the truth; see Section 3.3) were not appreciated by these people. Congregational church government virtually absolutises the office of all believers. Congregational church government stresses the local gathering to the exclusion of the fact that the Lord gathers a universal church. Collegial church government has its roots in the rise of humanism in the time of the Enlightenment. Christ’s existence is denied, and so there is no Head of the church in heaven. The church, then, is not a heavenly work performed on earth; the church is rather a society of like-minded people, a religious club made up of spiritually interested folk. In this understanding, it is evident that officebearers have no authority from heaven; whatever authority they have is given to them by the people of the church. Officebearers are no more than the peoples’ representatives. Collegial church government recognises no authority from heaven, and so finds its authority base in the people themselves. As such, collegial church government is simply democracy.